Assistant Sub Inspector (ASI) (RM)-152 Posts. Qualification-Matriculation with 3 year Diploma in Radio and TV Technology /Electronics/Telecommunication/Computer/Electrical/Mechanical Engineering or Domestic Appliances OR 10+2 qualified with minimum 50% marks subject being Physics, Chemistry and Mathematics.Age-18 to 25 years.Relaxation as per rules. Qualification-10th qualified + Two year Industrial Training Institute Certificate in Radio and TV or Electronics. Total-622 Posts. Mode of Selection- The selection will be made on the basis of written test + Physical Efficiency Test and interviews. PST.PET,Document Verification and Final Medical. Last date-Last date of receipt of application is 15.07.2016. Physics-50 Marks, Chemistry 50 Marks,Mathematics-500 marks and English & G K 50 Marks. A paper of maximum 100 marks covering Physics, Chemistry & English (10+2 standard). 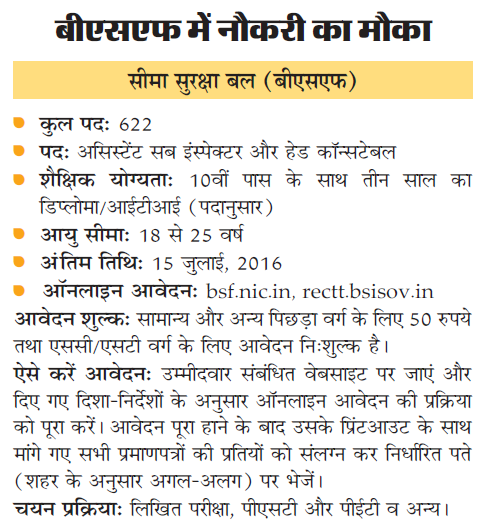 Application Fee-50/-for General and OBC candidates.